Kit for waterproofing tub surrounds from Schluter provides a simple upgrade that is said to pay dividends for the homeowner. The Schluter-Kerdi-Tubkit creates a bathroom area that is hygienic and maintenance-free and has a luxurious look that can’t be matched by other materials, the company says. 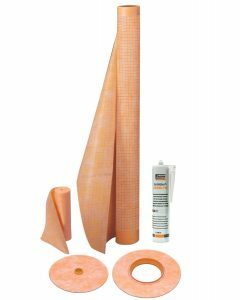 The main component of the kit is a roll of Schluter-Kerdi, a sheet-applied waterproofing membrane made of pliable polyethylene that is covered on both sides with fleece webbing. The membrane is used to waterproof the walls before the tiles are installed. The sheet membrane is applied to the walls, using thin-set mortar. The kit also includes a tube of Kerdi-Fix sealing and bonding compound to create a waterproof seal around the tub flange. Other components in the kit are a 4-1/2 in. mixing valve seal and a ¾ in. pipe seal.